For the music editor, see Christopher Kennedy (music editor). Christopher George "Chris" Kennedy (born July 4, 1963) is an American businessman, politician, and Chair of Joseph P. Kennedy Enterprises, Inc. He is a son of former U.S. Senator Robert F. Kennedy, a member of the Kennedy family. Kennedy served as Chair of the Board of Trustees for the University of Illinois from 2009 to 2015. Until April 2012, he was also president of Merchandise Mart Properties, a commercial property management firm based in Chicago. He was a candidate in the Democratic Party primary for Governor of Illinois in the 2018 election. He grew up at his family home, Hickory Hill, in McLean, Virginia, a suburb of Washington, D.C., and attended the Our Lady of Victory Catholic School in McLean through the eighth grade. He transferred to Georgetown Preparatory School in North Bethesda, Maryland, also a suburb of Washington, and graduated in 1982. While in high school, he volunteered at a home for runaway youth. Kennedy graduated from Boston College in Chestnut Hill, Massachusetts, with a Bachelor of Arts degree in political science in 1986. In 1994, he graduated with a master of business administration degree from the Kellogg School of Management at Northwestern University in Evanston, Illinois. Kennedy is chairman of the Kennedy family investment firm Joseph P. Kennedy Enterprises, Inc. He is treasurer of the Joseph P. Kennedy Jr. Foundation, he was on the Executive Committee for the Chicago Community Trust, and he has been a board member of the Catholic Theological Union, Interface, Inc. and Knoll Inc. He is a member of the mutual fund board of trustees for Ariel Investments. Kennedy moved from Boston to Decatur to work for Archer Daniels Midland in the 1980s, and has spent his life working around issues of hunger, whether as the chairman of the Greater Chicago Food Depository, or now helping to run the non-profit he and his wife founded, Top Box Foods. Kennedy was the president of Merchandise Mart Properties in Chicago, Illinois, from 2000 until 2012. The property was originally owned by the Kennedy family until it was sold to Vornado Realty Trust, a real estate investment trust. The Merchandise Mart, one of the properties of Merchandise Mart Properties, is the largest commercial building in the world, serving as both a luxury wholesale design center and one of the leading international business locations in Chicago. The Mart spans two city blocks and rises twenty-five stories for a total of 4.2 million square feet (390,000 square metres) Three million people come through the Mart each year to visit its retail shops, permanent showrooms, and office space as well as attend the numerous trade, consumer and community events hosted there. Kennedy also served as Chairman of the board at the University of Illinois. In May 2012, Kennedy started the Chicago-based non-profit Top Box Foods. The organization was created as a way to get discounted groceries to families who live in areas that either lack grocery stores or have an abundance of fast food. Kennedy initially invested $150,000 to get Top Box started, and subsequently designed the organization to be self-sustaining. Top Box as an organization purchases food, boxes it in various combinations and delivers it monthly to churches and organizations in mostly low-income neighborhoods. The food items in the box change from month to month and include a wide variety of fruits, vegetables, meats, and frozen meals, with box prices ranging from $19 to $39. The boxes can be ordered online or through the organizations where the boxes are delivered. These organizations, otherwise known as Top Box "host sites," range from small neighborhood churches with a few dozen families to some of the Chicago's largest, including Trinity United Church of Christ and Salem Baptist Church. Kennedy met Sheila Sinclair-Berner (born December 4, 1962), an Illinois native, while attending Boston College. After graduating from college in 1986, Kennedy moved to Decatur, Illinois, and married in 1987. The couple had four children, Katherine Frances Kennedy (1990-), Christopher George Kennedy, Jr. (1992-), Sarah Louise Kennedy (1994-), and Clare Rose Kennedy (1998-), whom they are raising in the Chicago suburb of Kenilworth. His wife earned a law degree from Northwestern University and practiced at Sidley & Austin in Chicago before taking time off to take care of their children. Kennedy attending Chicago's Pride Parade. Kennedy's political activism began at an early age, and in 1979 and 1980 he worked on his uncle U.S. Senator Ted Kennedy's bid for the 1980 Democratic Party's nomination for U.S. President. He was also treasurer of the campaign committee for his brother Joe's reelection to the U.S. House in 1988. Over the years he has organized numerous fundraising events in Chicago for his uncle Ted, his sister Kathleen, his brother Joe and his cousin Mark Shriver. The National Journal once quoted Kennedy as saying, "I have a lot to keep up with: a brother who might run for Congress, a sister and a brother considering races for governor, a cousin who might run for Congress, another in Congress, an uncle in the Senate and a cousin-in-law, Arnold [Schwarzennegger], who is thinking of running for governor." Beyond his family, Kennedy has served in a variety of capacities for numerous political campaigns, including hosting a fundraiser for Barack Obama in his bid for U.S. Senate. In August 2009, after considering a run for the U.S. Senate, as did many others, Kennedy decided not to run. Also in August 2009, on the day after his uncle Ted's death on August 25, 2009, Kennedy was appointed to the University of Illinois board of trustees by Democratic Illinois Governor Pat Quinn. On September 10, 2009, Kennedy was elected by the trustees as their chairman. Prior to February 8, 2017, when Kennedy announced his candidacy for the Democratic Nomination for Illinois Governor in 2018, he had never ran for any elective office. Kennedy during his campaign for governor advocated for "a property tax system that can't be abused by the wealthy and insiders" in a fundraising email. Kennedy criticized one of his fellow Democratic gubernatorial candidates, J.B. Pritzker, for getting a large property tax reduction on a Gold Coast mansion. "It's an inherently corruptible system and we ought to reject it," Kennedy said to reporters in reference to Pritzker's property taxes. "The Cook County property tax appeals business is notorious for pricing political connections at a premium," wrote the Illinois Policy Institute, a conservative website. Kennedy has further gone on to state that what Mike Madigan is doing, referring to his conflict of interest from serving as the house speaker while working as a property tax attorney, should be illegal. In June 2017, Kennedy was endorsed by Congressman Bobby Rush. Kennedy called for an open primary in the 2018 gubernatorial race, urging the Cook County Democratic party not to throw their weight behind any other candidate, instead allowing for voters to vet all the candidates in the race. On March 20, 2018, Kennedy lost the Democratic primary, finishing in third place behind Pritzer and state senator Daniel Biss. He carried only two counties, Ford and Hardin. He is on the board of trustees of the mutual funds managed by Ariel Investments, a Chicago-based investment-management firm. From 1997 to 1999, Kennedy served as chairman of the Chicago Convention and Tourism Bureau, a sales-and-marketing organization promoting Chicago to the tourism and convention industries. Under Kennedy's chairmanship, the bureau retained and expanded Chicago's event-and-convention industry. Since 2000, Kennedy has been a member of the City Club of Chicago, a group that brings together civic and cultural leaders to discuss and debate issues affecting the Chicago area. Since 2005, he has been a member of the Commercial Club of Chicago, a group that brings together the city's business, educational, and cultural leaders on projects to improve central industries and create new economic opportunities. Since 1996, he has been a member of the Chicago Council on Global Affairs, a nonpartisan group that seeks to impact discourse on global issues through leadership, education, and policy. Since 1996, Kennedy has been on the board of directors at The Irish Fellowship Club, a Chicago-based group dedicated to preserving and promoting Irish heritage. From 2006 until the Spring of 2013, he served on the board of directors of Catholic Theological Union, the largest Roman Catholic graduate school of theology and ministry in the U.S. Greater Chicago Food Depository is a nonprofit food distribution and training center providing food for hungry people while striving to end hunger throughout Cook County, Illinois. It also offers education programs providing the knowledge and tools needed to break the poverty cycle. El Valor is a nonprofit group seeking to enrich the local community by empowering the underserved, disenfranchised, and disabled while creating a sense of unity among all community members. Heartland Alliance is a human-rights-advocacy group providing housing, healthcare, economic security, and legal protection for low-income citizens. Governor Pat Quinn appointed Kennedy to the Board of Trustees of the University of Illinois in September 2009. He served in that role until his gubernatorial appointment expired in January 2015. He served as a Member of the Executive Committee of the Chicago Community Trust until January 2015. He served as the Lund-Gill Chair in the Rosary College of Arts and Sciences at Dominican University (Illinois). He is the chairman of the board of Innovation Illinois, a progressive 501(c)(4) non-profit advocacy group formed in April 2015. As Chairman of Joseph P. Kennedy Enterprises, Inc., Kennedy is responsible for the development of the Kennedy family real estate holdings in Chicago known as Wolf Point, Chicago. The Wolf Point development site represents a billion-dollar commitment to the downtown core, and the site is zoned for construction of a residential apartment building, a self-park garage, and two additional high-rise buildings. Kennedy also is a partner in Sudbury Station LLC, a development entity proposing a 250-unit luxury rental housing development with a state mandated minimum affordable housing set aside in Sudbury, Massachusetts, designed to meet local housing needs for seniors and the working class community. Proposed on a 39-acre parcel zoned residential near the Historic District of Sudbury, the Village at Sudbury Station would satisfy the Massachusetts affordable housing mandate for Sudbury, would be located close to schools, parks, churches and public safety facilities, and would contribute significant additional tax revenue to the town. The project has received criticism from town officials and residents. Residents voted unamiously to hire a special counsel to stop the development, which they allege violates over thirty local zoning ordinances. ^ a b Administrator. "Ariel Investments - Christopher G. Kennedy". www.arielinvestments.com. Retrieved 2018-02-22. ^ "Christopher G. Kennedy | The University of Illinois Board of Trustees". www.bot.uillinois.edu. Archived from the original on 2014-08-02. Retrieved 2014-07-14. ^ "Chris Kennedy moving closer to bid for governor". Politico PRO. ^ Pearson, Rick. "Chris Kennedy to run for Illinois governor, says 'compromise is not surrender' in dig at Rauner". chicagotribune.com. ^ "Education". www.kennedy-web.com. Archived from the original on 2018-02-04. Retrieved 2018-02-22. ^ "Notable Alumni". Georgetown Preparatory School. Retrieved October 12, 2018. ^ "American Experience | The Kennedys | Kennedy Family Tree | PBS". Archived from the original on 2009-03-13. Retrieved 2009-03-05. ^ O'Donnell, Carl. "How The $1 Billion Kennedy Family Fortune Defies Death And Taxes". Forbes. Retrieved 2018-02-22. ^ "Ariel Investments - Mutual Fund Board of Trustees". www.arielinvestments.com. Retrieved 2018-02-22. ^ "Can Chris Kennedy fix Illinois? ", The Economist, February 13, 2017. Retrieved June 26, 2017. ^ "Kennedy re-elected U of I Board chairman", University of Illinois, January 23, 2017. Retrieved June 26, 2017. ^ Staff writer (August 16, 1987). "Sheila Sinclair Berner Wed To Christopher G. Kennedy". The New York Times. Accessed August 26, 2009. ^ "Favorite Web Sites Of Chris Kennedy, President Of Merchandise Mart Properties Inc.", Chicago Tribune, April 01, 2001. Retrieved June 26, 2017. ^ Stantis, Scott (August 18, 2009). "Chris Kennedy Won’t Run". Chicago Tribune. Accessed September 20, 2009. ^ Pearson, Rick (August 18, 2009). "Chris Kennedy Won’t Run in 2010 for Senate or Governor". Chicago Tribune. Accessed August 26, 2009. ^ a b Staff writer (August 26, 2009). [clarification needed] "Chris Kennedy to be named UI Trustee"[permanent dead link]. The Associated Press via The Daily Illini. Accessed August 26, 2009. ^ "New U. of I. trustees pick Kennedy to lead them" Chicago Tribune. Accessed September 10, 2009. 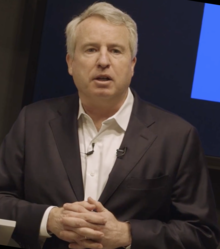 ^ "Sneed: Chris Kennedy announces run for governor". Chicago Sun-Times. Retrieved 2018-02-22. ^ "Capitol Fax.com - Your Illinois News Radar » Kennedy decries insiders, promises "radical change"". capitolfax.com. Retrieved 2017-06-01. ^ "For J.B. Pritzker, mansion's disrepair has saved $230K in taxes". Chicago Sun-Times. 2017-05-12. Retrieved 2017-06-01. ^ "Kennedy, Biss hit Pritzker on property taxes". ILLINOISHOMEPAGE. Retrieved 2017-06-01. ^ "Madigan's millions: How the speaker sells his sway". Illinois Policy. 2017-02-08. Retrieved 2017-06-01. ^ Pyke, Marni "Chris Kennedy: What Mike Madigan is doing should be illegal". Daily Herald. 2017-10-18. Retrieved 2017-11-10. ^ "Congressman Bobby Rush Endorses Chris Kennedy for Illinois Governor", NBC 5 Chicago, June 20, 2017. Retrieved June 26, 2017. ^ Pearson, Rick. "Kennedy urges Democratic leaders to not endorse in governor primary as candidates speak", Chicago Tribune, June 22, 2017. Retrieved June 26, 2017. ^ "Ariel Investments". www.arielinvestments.com. Retrieved 2018-02-22. ^ "About – Catholic Theological Union". www.ctu.edu. Retrieved 2018-02-22. ^ "El Valor Non-Profit Community-Based Organization". www.elvalor.org. Retrieved 2018-02-22. ^ "Working to improve the lives of millions | Heartland Alliance". Heartland Alliance. Retrieved 2018-02-22. ^ "Village at Sudbury Station Application » Planning & Community Development". sudbury.ma.us. Retrieved 2018-02-22. ^ "Fiscal Impact Analysis Village at Sudbury Station_4.20.16 » Planning & Community Development". sudbury.ma.us. Retrieved 2018-02-22. ^ "The Sudbury Town Crier: Local & World News, Sports & Entertainment in Sudbury, MA". The Sudbury Town Crier. Archived from the original on 2018-02-22. Retrieved 2018-02-22. ^ "Office of Selectmen letter" (PDF). 2015-05-11.